Arvah Branch is a great little neighborhood of just under 100 homes, located in Northeast Tallahassee. If you travel along Miccosukee Road heading North, you'll find its secluded location just north of the interstate. Once you arrive, you'll find executive styled homes situated on home sites that generally range from 1 to 5 acres each, so the draw for many homeowners is more house and more land in a location close to town. Arvah Branch has been bruised by the housing market like like everywhere else in our area, so this equates to great opportunities present themselves with buyers who are prepared when the situation arises. 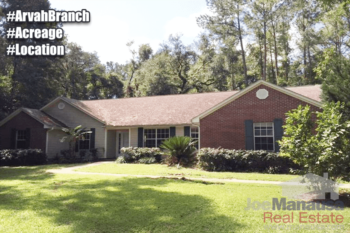 In this report, we examine prices, values, and sizes of homes in Arvah Branch, as well as the current listings in the Tallahassee MLS and all closed home sales going back to 1991. For each of the three graphs utilized in this report, we show the number of closed home sales for each year (red columns, measured on the left vertical axis), and an important real estate trend shown in blue (measured on the right vertical axis). It is important to note that the narrative contained below is for sales through December for all previous years, but through the second week of November in 2015. The graphs and the closed sales table will be continuously updated into the future (meaning bookmark this page if you always want to know the current status of homes in the Arvah Branch). Average home prices are down nearly 10% when compared to last year, which explains why activity has been above average thus far in 2015. Currently, home prices are 32% lower than what we recorded in 2007. The six closed sales have averaged $220,833 this year. Home sales activity in Arvah Branch is sporadic due to its relatively small size. 2013 was a breakout year, posting 10 homes sold (second most on record). Last year there were only two homes sold, while this year has sprung back up to 6. This type of up and down results is very common for neighborhoods of this size. Average home values in Arvah Branch show a whopping 14% decline compared to last year, but that is due the high number of distressed sales this year. Currently, there are only two homes on the market in Arvah Branch, and one of them is a bank-owned property, which once closed will continue to result in lower values being reported. The current average home value in Arvah Branch is $101 per square foot, which is 32% below the peak of the market values recorded in 2007. This means that many homeowners who have purchased or refinanced in the past 10 years are likely at zero or negative equity situations, and that's why many of the home sales have been distressed sales (and why more are likely in the near future). The average home size sold in Arvah Branch typically falls in a range of 1,800 to 2,400 square feet, and this year's sales have been for homes that fall into the mid to upper end of this range. The six homes sold thus far in 2015 averaged 2,195 square feet. The following list shows roughly 200 home sales in Arvah Branch going back to 1991. I hope you enjoyed our November 2015 update on home sales in Arvah Branch, please feel free to drop me a note if you have questions not covered in this report.